Cricket is the most popular sport in the city. 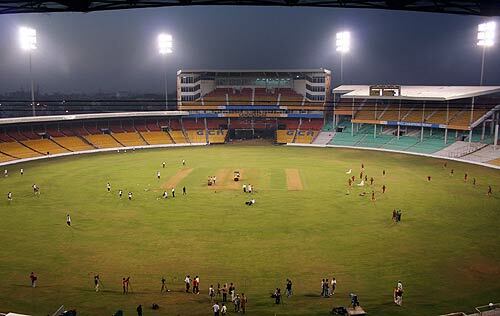 Sardar Patel Stadium, built in 1982, hosts both one-day internationals and test matches. The stadium also hosted the 1996 Cricket World Cup. Ahmedabad also has a second cricket stadium at the Ahmedabad Municipal Corporation's Sports Club of Gujarat which is the home ground of the Gujarat cricket team that plays in domestic tournament of Ranji Trophy. City is represented by Ahmedabad Rockets in Indian Cricket League which is played in Twenty20 format of the game. Other sports gaining popularity are field hockey, badminton, tennis, and squash. Ahmedabad currently has three golf courses. Mithakhali Multi Sports Complex is being developed by the AMC to promote various indoor sports. There has been a significant increase in recent years in the number of private sports clubs, gymkhanas, gymnasia and sports teams sponsored by corporations, private associations, schools and colleges. Young people congregate in the evenings to play cricket and football at numerous public and neighbourhood grounds. Recently Ahmedabad hosted national level games for roller skating and Table Tennis. Kart racing is fast gaining popularity in the city, with facility of 380 meter long track based on Formula One concept. In 2007, Ahmedabad hosted the 51st national level shooting games. Geet Sethi, a five-time winner of the World Professional Billiards Championship and a recipient of India's highest sporting award, the Rajiv Gandhi Khel Ratna, hails from Ahmedabad. Ahmedabad has produced cricketers such as Jasu Patel and Parthiv Patel who have been members of the Indian cricket team. Tejas Bakre, a chess grandmaster, is from Ahmedabad. Soccer has also become a very popular sport in Ahmedabad. Gujarat's best goalkeeper Anukal Yana is from Ahmedabad and Gujarat's best midfielder Rajesh Tadvi is also from Ahmedabad.